The K&N 33-2291 fits some Thermo King KD.II Max, Thermo King MDII- max - SDZ, Thermo King RD.II SR, Thermo King RDII - max, Thermo King TD.I, and Thermo King TD.II Max models. See vehicle applications for details. K&N universal panel air filters are made with low restriction filter media for high air flow. They provide outstanding filtration and can be used for custom or racing needs. 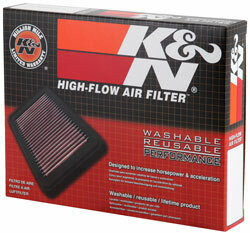 These filters are washable and reusable and come with K&N's one year limited warranty.